Tibetan spiritual leader the Dalai Lama, left, greets devotees as he arrives to give a talk at the Tsuglakhang temple in Dharmsala, India, Monday, Sept. 7, 2015. During an interview with a German newspaper, he said that Europe has allowed too many refugees in. The Dalai Lama, Tibet's spiritual leader, said Europe has allowed too many refugees into the continent, NBC News reported. In an interview with Germany's Frankfurter Allgemeine Zeitung newspaper, the Dalai Lama said "we feel the misery" of each refugee and have a "responsibility to help," but that Europe has been overwhelmed by the number. "Europe, for example Germany, cannot become an Arab country. Germany is Germany," the Dalai Lama said in the interview. "There are so many." 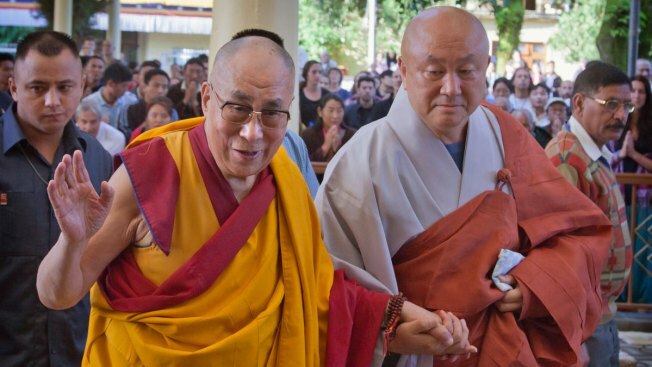 The Dalai Lama said "from a moral standpoint" he thinks refugees should "only be accommodated temporarily" — with the goal of them returning home to rebuild their countries.